Actually, I work on Saturdays pretty often. When I have two days off in a row, it is a really big deal! 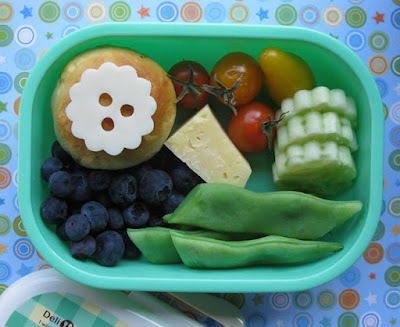 I put this bento together in 10 minutes with bento stash (the biscuit) and some fresh veggies and fruit. In this bento: a biscuit filled with Fra'mani Rosemary Ham and Duqqah from The Handmade Pantry topped with a piece of provolone cheese cut into a floral shape, cherry tomatoes, cucumber slices, a hunk of Valley Ford Cheese Co cheese, steamed Romano green beans from Crescent Moon Farms, and some blueberries. I didn't make it to the Santa Rosa Original Certified Farmers Market today, but it is a great resource for bento supplies. If you are trying to eat healthier and include local foods in your diet, head to your local farmers market! Labels: bento, blueberries, cucumber, Fra'mani, green beans, Handmade Pantry, Santa Rosa Farmers Market, tomato, Valley Ford Cheese Co. Sorry you have to work so much! I hope you like your job. :) I think a little bento can bring a smile to your day, and the healthy food can give you a boost to make it through a bit more time at work. Have a good time at work today, tatabonita! Working in a school I get the summer off, but it's hard when the money isn't there like the rest of the time. We make our lunch often! I like your quick bento! The biscuits are great! I wasn't sure what duqqah was I had to look, Never seen it spelt that way before. I posted making this on my Tiny Skillet blog but I've spelled it dukkah! I love it! Made dukkah crusted chicken with it too. Lovely summery fresh bento! The provolone accent is really adorable. I agree, visting one's farmer's market and falling in love with beautiful local produce grown nearby is a wonderful way to bento and eat! Hi Lyndsey! My parents were teachers (now retired) and we loved having all summer long to play and hang out with them. I miss those days! And I am glad there is someone else who has tried Dukkah/Duqqah. Isn't it yummy? !